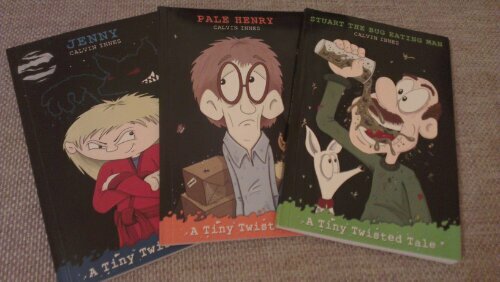 Tiny Twisted Tales is a new series of books by Calvin Innes, telling weird and wonderful stories in a very humorous style. Each of the stories is named after its central character, and each has an important lesson to teach its readers. There’s Stuart The Bug Eating Man, who loves to eat worms, spiders and insects, much to the disgust of his family. That is, until he figures out a way to use his unusual tastes to make the family rich. Pale Henry tells of a young boy who doesn’t like to go outside and play with other children, preferring to hide himself away in the attic. Until one day he does venture outside, and discovers that it’s fun to play in the sun with others. Rounding off the first 3 releases in the series (more are planned for the future) is Jenny, an eight year old girl with a secret double life: she hunts werewolves! In the story, Jenny catches a particularly large and scary werewolf, and ends up keeping if as a pet! The books, all published by My Little Big Town, are aimed at primary school children and designed to make learning to read fun. And they most definitely are fun, with each twisted tale told in clever rhyme. The accompanying illustrations are great too, and really bring the stories to life. I read these to my own little monsters, to see what they thought, and got a definite thumbs up. Heather’s favourite was definitely Stuart, which she’s asked me to read her several times. Her reaction to the description of Stuart’s meals was brilliant, with each horrible detail making her wriggle and squirm – just like the worms and bugs in the story! She obviously didn’t find them too horrible, though, because she asked to read them again straight way. As for Megan, I think she liked Jenny the werewolf hunter the best. At least that’s my interpretation of her waving the book around and shouting “Jenny” at the top of her voice – impressive given her still limited vocabulary! Definitely a hit though, and something different to the princess books I normally get asked to read to the girls! I’ll be keeping an eye out for new books appearing in the series. Tiny Twisted Tales are published by My Little Big Town, and are available to buy from Amazon and other retailers. I was sent these items for review, but have not been paid for mentioning any of them in this post. All words and opinions are my own, and links have been included out of courtesy. This entry was posted in Books and tagged book review, calvin innes, jenny, my little big town, pale henry, stuart the bug eating man, tiny twisted tales by richy. Bookmark the permalink. I have also reviewed Pale Henry recently. Hope you don’t mind me adding a link to your blog review on my post.